Please tell me that I am not the only one who loathe summer. Tell me that you dislike the sultry heat and 100% humidity as much as coming home ravenous to an empty fridge. (or whatever you really dread). If I could, I'd hide inside an air-conditioned room and eat ice cream for the whole summer. Reading books and food blogs pretending that it is any season but summer. But if I really do that, I'd miss these juicy strawberries and mound of rhubarb stalks piling gloriously high in the farmers' market. The sweetest, ripest strawberries have finally arrived in my neck of the wood, taking over the spotlight from their mediocre predecessors. I reached for one punnet, then another, and another, and finally decided that I might as well take half a dozen of them. Afterall, it was more "cost effective" that way. As I sauntered towards the vegetables section, a worker was opening a box of rhubarbs and piling them up under the sign that reads " California Rhubarb $1.99/pound". The next five minutes, I was trying to grab as many stalks as my bag allowed. Which came up to be slightly less than 4 pounds. I was already thinking of incorporating some in my May Daring Bakers Challenge, and some in the form of tart, cake and sorbet. Suddenly, summer seems bearable. The heat and humidity is justifiable for the sweetest berries it promises. I need to write down a list of "10 reasons why I love Summer" and stick it on my laptop. The first reason would be this strawberry rhubarb tart. Made with my favorite buttery sweet tart dough, and a topping of macerated strawberry and rhubarb that baked to a jam consistency. The peak of season fruits really doesn't need much adornment. Even OCT who isn't a strawberry fan polishes one up when I insist that he tries a bite. 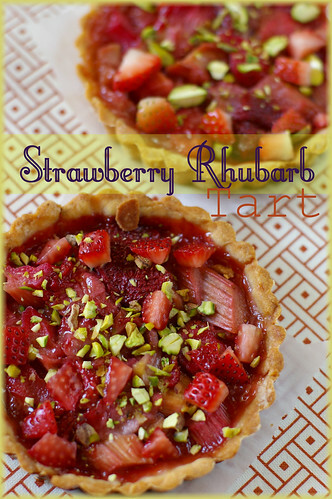 This recipe is inspired by Anita's strawberry rhubarb tart, which she made for her birthday. I added vanilla sugar to macerate the fruits, and cornstarch to thicken up the juice. Sprinkle with chopped pistachio adds color and crunch to the tart. Follow the instruction on the sweet tart dough recipe to bake the tart shells using your tart rings or tart molds with removable bottom. Remove from oven when the tart shells are dry and lightly colored. Combine the sliced strawberries, rhubarbs, sugar and cornstarch in a big bowl. Add a splash of lemon juice if you wish. Let rest for 5 minuts. Taste the fruit, add sugar to taste. Brush the eggwash on the bottom of tart shells. Spoon the macerated fruits into the shells. Becareful not to pack too much filling into each shells. Add spoonful of juice collected at the bottom of bowl into each shells and bake for 35-40 minutes at preheated 350F oven. The filling will bubbling when it's almost ready. The fruit and juice should looked set when it's ready. The finished tart will have a filling of jam consistency and not runny. Remove the cooked tarts from oven and let cool. 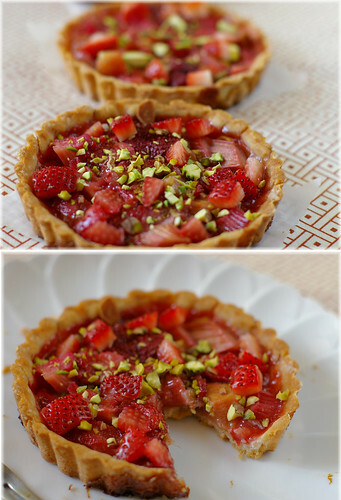 Sprinkle with chopped pistachio and fresh strawberries for color. Serve with a scoop of ice cream or as it is to fully enjoy the flavors of the tart. Makes 5 3.5-inches individual tarts. Berries are my only reasons for stepping out of my air conditioned home in the summers :P...I love em so much, I'm willing to go berry picking on an actual farm tomorrow just so I can hand pick my very own berries :D.
Your tarts look delicious...elegant yet homey and comforting at the same time! BTW, there must be something wrong with you and manggy :-) You guys should move to the Pacific northwest and then you'll be praying for warm weather. Beautiful pictures and beautiful tarts! I am one person that hate summer. Can't stand the heat and humidity :) Like Manggy the only thing good about summer is the fresh fruits :) I like your strawberry rhubard tarts!! Summer has yet to hit us here in the pacific northwest! So I would love some heat. BUT, we do have an abundance of rhubarb right now, so I'm not complaining. I love the tarts! The pistachios are also a nice touch. Just lovely. I was hoping that the little green sprinkling on the top was Pistachios - and it was! 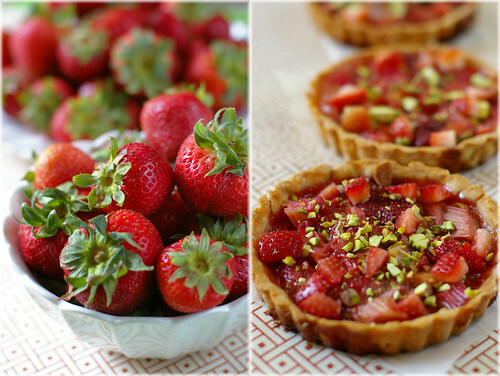 Beautiful Tarts; there's nothing quite like soft and sweet roasted Strawberries. Those tarts look really good. I like the pistachios on top. Those are just gorgeous! I had to laugh because I am not a summer person myself. I love the fall and even prefer the winter to summer. The only thing that makes summer bearable is all the beautiful fruit and vegetables, many of which we get fresh from our garden! These tarts are just so very pretty! yeap, i'm definately one of those, coming from a hot, humid country. Oh I don't hate summer, maybe because we don't have good weather here . I am just waiting to get some sunshine here. I lovez this tart it looks so super delicious. What beautiful pictures of your tart! I just found your blog and am loving it! Gorgeous tarts! That's enough reason to love summer right there. Oh my goodness, this looks divine! I've been dying for some strawberry rhubarb desserts lately, but with 2 apartments in 2 different cities (who can find any baking supplies when you're moving?) & an oven that just began working again, it's probably not in my future anytime soon! Girl, those are GORGEOUS!! Oh, they're making me miss the strawberries of summer so much, thinking that I have to wait 6 months for them to come back is heartbreaking, especially when you're teasing with fruity recipes like this! I love berries and I'm so glad it's the season of berries again! I've never eaten rhubarb before but yours tart looks so yummy! Makes me want to get my hands on one of these tarts! what pretty strawberry tarts. 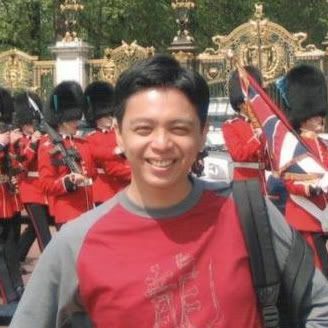 i like your blog! Mandy, they look so delish and pretty!! nice photographs as always. I never get bored of eating strawberry but I think I will skip rhubarb at this time though. I know. :( We used to joke that there's two kind weathers, rainy or sunny. :p But you are right on the produce! You are so lucky! I think the berries picking season has just ended at my neck of the wood. LOL~ how I wish we can trade place. I wouldn't mind the winter weather, as long as there's plenty of produce. lucky you. Beautiful produce without the heat. thanks!The pistachio really added a nice crunch to the tart. Fresh from the garden vegetables and fruits are unbeatable. thanks!I am glad you like what you have seen here. yes, you have to try this combination! Strawberry and rhubarb are made for one another. Awww....I wish I could pass some of these to you. It's definitely not easy juggling between two places. I'm with you on this one. LOVE the fruits of summer, but hate the heat. You can't even enjoy ice-cream properly because it melts so quickly! What a beautiful tart! And as much as I don't love the heat, I'll take the heat and the fresh fruits and veggies over the dreary winter! Gorgeous tarts! I am planning to make these tomorrow :) One question though- at what temperature did you bake them? I baked it at 350F. Let me know if you make it! They came out beautifully.. Thank you for such a simple and delicious dessert! The tarts are just gorgeous! My mom used to make the best strawberry rhubarb pie, but I've never tried the combo myself. You're inspiring me! These are too cute, I really love the colors! 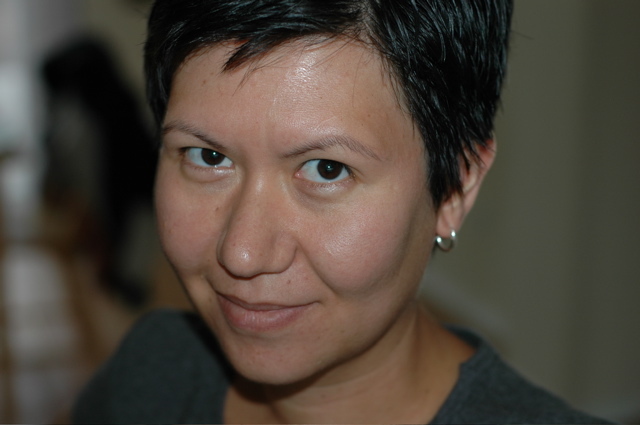 Thanx so much for sharing your wonderful blog with us. When I typed 'strawbery rhubarb tart' into google, I was surprised that there were so few results. Tarts beat pies any day in my book, and strawberry-rhubarb pie would not due. This was INCREDIBLE. A mother's day favorite, and I wish I could claim the recipe! I served mine with a dollop of creme fraiche, and the pistachios added just the right amount of sophistacation...Delectable. Just tried these. And they are awesome! Rhubarbs+strawberries rocks (: You can check it in my blog too. Thank you for this wonderful recipe! I made it yesterday using pre-made frozen tart shells. I used just a little more rhubarb because I like it so much and had it on hand. It made 15 little tarts and they're delicious! Oh, I also skipped the fresh berries on top and sprinkled a little freshly chopped basil on top, instead. My pistachios weren't salted, so I sprinkled a little sea salt on top of each one while the tarts were warm. Delicious!! And so simple to make! I have a new favorite summer recipe! Thanks again! PS - Summer is my LEAST favorite season, as well!